Deep in the Seaward Kaikoura Mountain Range lies a unique high country lodge. Located in Puhi Peaks Station, New Zealand’s highest privately owned land, Shearwater Lodge is an exclusive eco resort and welcome sight for those who walk the six hour hike through the Kaikoura wilderness to the lodge. Puhi Peaks Station is also unique, being a nature reserve and home to the Hutton’s Shearwater, the only seabird to nest at altitudes of 1200 – 1800 metres and one of only two remaining breeding colonies in the world. Damaged in the Kaikoura earthquakes, Shearwater Lodge needed to be assessed for seismic damage. Fox and Associates was called in by the project structural engineer to survey the lodge and put some numbers on the amount of damage. Due to the remote location, there was no real option to go back so we needed to capture all the required data in one site visit. 3D laser scanning gives project managers, architects and structural engineers more complete data to base decisions on. Whether designing a house, managing a construction project, or assessing a building for earthquake damage, 3D laser scanning captures what's there, what's on site and what the land, building or structure looks like in rich detail. 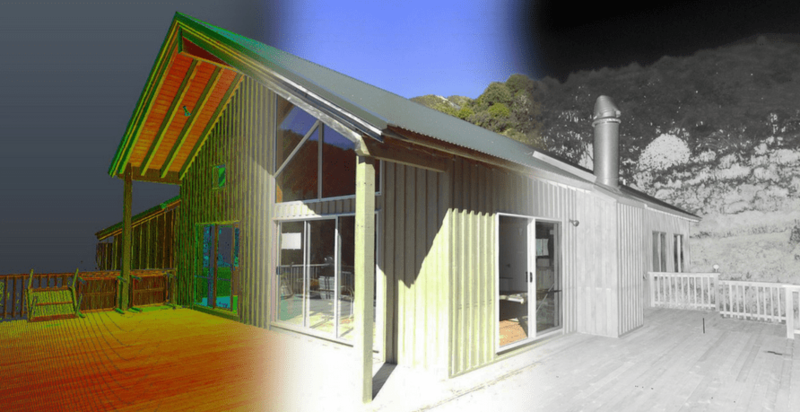 For the Shearwater Lodge project, we chose 3D laser scanning as the best surveying tool for the job. We flew in by helicopter, measured the lodge inside and out within a day, and gained all the data needed to provide the structural engineer with a report to assist their assessment and development of a repair process. A laser scanner works by scanning the surface of a structure and capturing it as millions of points called a point cloud. Once the point cloud data is generated, specialist software is used to create the 3D computer models, 2D drawings, photos, surveys, measurements, and reports you need to visualise, plan and develop your project. As a laser scanner can capture huge amounts of data very quickly, your complex jobs can often be done in quick time. It also means that if you want more information after we’ve delivered your initial data, we can usually extract that information without needing to go back into the field. Laser scanning is a perfect tool to use when precise measurements are needed. It is also useful for projects where data needs to be captured remotely. An example is measuring the surface of a highway. Laser scanning allows you to safely measure those points from the side of the road rather than standing on it. The added benefit is that the highway doesn’t have to be closed for the work to be done. Another example is a recent project where a large building in Christchurch city was undergoing significant refurbishment. The old windows had been knocked out and the project manager needed to know the exact measurements of each hole to confirm the size of the new large glass panels. By remotely laser scanning the face of the building structure, we were able to capture and deliver the data safely and efficiently. Fox & Associates is all about looking for a better way to help you and your project. Digital technology is changing our surveying options. Alongside laser scanning, we can also use UAV aerial surveying, GPS and Total Stations to capture all your spatial data needs. We've got all the tools to solve your problem and deliver the solution you need for your project.